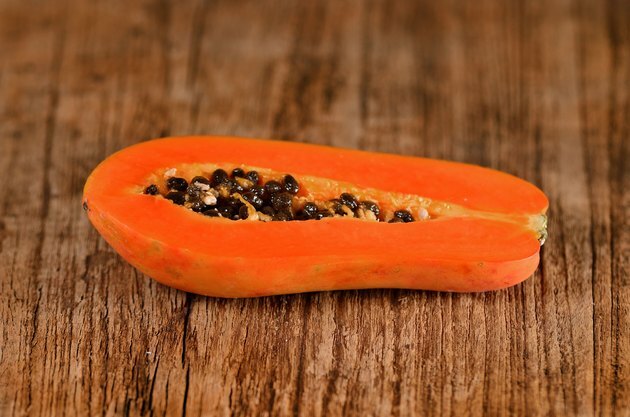 Papaya is a sweet tasting exotic fruit that stands out with it's slight musky flavor and soft consistency. Not only does it make a nice addition to your fruit salad, but it also provides health benefits. Papaya aids in digestion and helps reduce inflammation. The oil located in the papaya seeds is used in health and beauty agents. In fact, according to Holly Lucille ND, RN, papaya oil boosts the immune system and also works as an anti-aging skin care agent. Extracting the oil from the seeds is relatively easy; you can do it at home. Lightly squeeze the papaya to make sure it is ripe. If it is slightly soft, it is ready to open. Cut the papaya lengthwise down the center using a large knife. It will have a bright orange hue throughout when it is perfectly ripe. If there is a little yellow tint to the fruit, it is still okay to use. Scoop out only the seeds and place them in the cheesecloth. Do not scoop out any of the flesh. Thoroughly rinse the seeds with cool water to get rid of any juice or pieces of fruit left behind. Turn the oil press on and bring it to the correct temperature listed on the instructions for cold pressed oil. The temperature should not exceed 120 degrees Fahrenheit. Follow the instructions for the oil press you are using. Place the seeds inside the machine to extract the oil. When finished, store the oil in a glass container to preserve it. Each oil press machine has different instructions. Follow them correctly. Do not throw away the flesh of the fruit. Eat it as is or use it in an exotic recipe. Oil press machines can become dangerous if not used properly. Follow directions for the specific model you are using. What Are the Benefits of Gingelly Oil?